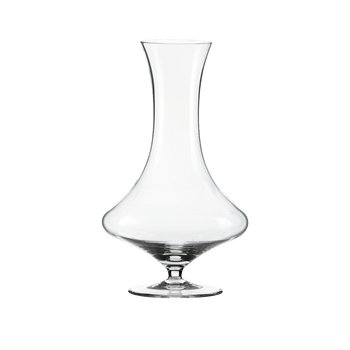 Home Shop RIEDEL Decanter Horn R.Q. The handmade decanter distinguishes by an elegant and complex design. Modeled after a musical horn’s coiled shape, the decanter is formed freely without the help of any molds, and proves extremely difficult to create. Requiring three master glassblowers’ efforts, the horn’s form is mouth blown with two openings on either end, the larger of which is to be used for both receiving and pouring wine. The decanter’s clear crystal color is accented by a large regal golden yellow stripe outlined by two black lines following the contours of its curved silhouette. In homage to the RIEDEL family’s central European heritage in Austria and Bohemia, the Horn decanter was in fact inspired by the iconic insignia that symbolizes the Austrian Post’s mail delivery system. Europe’s 18th and 19th century mail system utilized horse drawn carriages to deliver mail between cities, and to announce their arrival, mail carriers would play the Post Horn to notify the public. Influential musicians of this time period, like Wolfgang Amadeus Mozart, the Austrian composer born in 1756, the same year of RIEDEL’s founding, also incorporated the horn into their music, and now modern day oenophiles and musicians alike can do the same, creating music by blowing into the Horn’s smaller opening. “The RIEDEL family has always enjoyed and valued music,” 11th-generation RIEDEL Crystal President & CEO Maximilian RIEDEL explains. 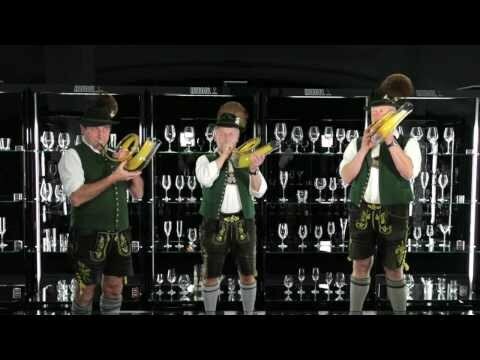 “With our creation of the Horn decanter we wanted to both celebrate the horn’s influence on Austrian culture and also further push the boundaries of decanting wine, as we always strive to do.” Like RIEDEL’s many other coiled decanters including the Eve, Mamba, Boa, and Titano Boa, the Horn decanter “double-decants” wine, a technology developed by RIEDEL to accelerate the aeration of wine by the creation of a vacuum within the vessel. The Horn’s coiled body brings wines to full flavor profile potential when decanted even more quickly than other RIEDEL decanters. RIEDEL tip: use bottle cleaners to remove stains inside the decanter. RQ = this item is supplied as 'Restaurant Quality' meaning that it may contain small imperfections when compared to the same item in 'best quality' and, as such, is offered at a special purchase price exclusively for use in restaurants.